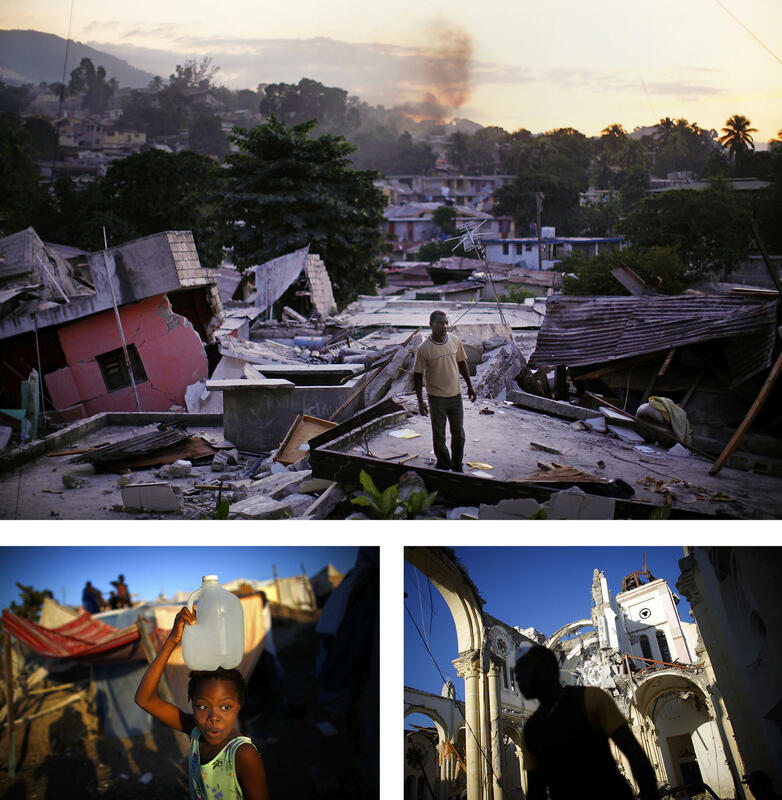 After the earthquake in Haiti, the American Red Cross raised nearly $500 million. Five years later, it is difficult to know where all that money went. The national headquarters for the American Red Cross in Washington, D.C.
Haiti, just days after a 7.0 magnitude earthquake destroyed much of the country on Jan. 12, 2010. The disaster uprooted many of its residents and killed more than 200,000 people. Today, Campeche, part of the larger Carrefour Feuilles neighborhood in Port-au-Prince, is where the Red Cross boasts one of its marquee housing projects. Evening in Campeche, a neighborhood that sits in the hills of Port-au-Prince. The neighborhood is part of a $24 million project the Red Cross has designated for a "physical renewal." Jean Jean Flaubert (lower right) says he was there when the Red Cross painted its logo on a wall in his neighborhood three years ago. Since then, he says, not much has changed. A man works on a pathway in Campeche. As the Red Cross prepares to leave the neighborhood at the end of this year, residents say the hundreds of houses the Red Cross told them would be built do not exist. 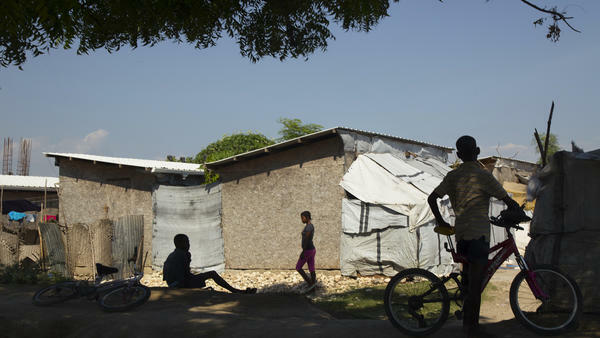 The American Red Cross says it "provided homes" for more than 130,000 Haitians, but acknowledges that much of that is made up of people who went to a training seminar on how to fix their homes, received temporary rental help or lived in shelters like these in Bon Repos, which start to disintegrate after three to five years. Residents say they don't have bathrooms, kitchens or running water. Minouche Lamour, a member of the Community Platform for Development in Campeche, says she doesn't see how millions of dollars from the Red Cross could have been spent in her neighborhood. Ask a lot of Haitians — even the country's former prime minister — and they will tell you they don't have any idea. "Five hundred million in Haiti is a lot of money," says Jean-Max Bellerive, who was prime minister until 2011. "I'm not a big mathematician, but I can make some additions. It doesn't add up for me." On a recent day, Bellerive was sipping coffee in his living room, high above Port-au-Prince, with Joel Boutroue, who was the United Nations deputy special representative in Haiti before the earthquake and an advisor to the Haitian government afterward. Boutroue says he can't account for where the nearly $500 million went either. They considered the Red Cross' claim on its website and press releases: That all the money went to help 4.5 million Haitians get "back on their feet." "No, no, not possible," Bellerive says. "We don't have that population in the area affected by the earthquake." "You know," Boutroue chimes in, "4.5 million was 100 percent of the urban area in 2010. One hundred percent. It would mean the American Red Cross would have served entire cities of Haiti." It's not unheard of for the Red Cross to make such a claim. Not long ago, the charity hired a group of consultants to review one of its projects in the north of the country. They found the charity's math unreliable when it came to counting people it helped. There was double-counting, undercounting, and in one instance the Red Cross claimed to have helped more people than actually lived there. David Meltzer, the Red Cross' general counsel and head of the international division, says the charity helped millions through trying and difficult circumstances, including a cholera outbreak and a government in disarray. "The Red Cross has provided clean water, sanitation, vaccinations, disaster preparedness, cholera prevention," he says. "All of the money that has been spent has been focused on benefiting the people of Haiti." Meltzer says the Red Cross took the almost $500 million and split it into sectors. For example, the organization spent $69 million on emergency relief, $170 million providing shelter and $49 million on water and sanitation efforts. The Red Cross also has outlined over the years some of the projects it has funded, such as millions of dollars given for new hospitals, vaccination programs, and disbursement of tents and water tablets. The charity says it has done more than 100 projects in Haiti, repairing 4,000 homes, giving several thousand families temporary shelters and donating $44 million for food. But the charity will not provide a list of specific programs it ran, how much they cost or what their expenses were. Meltzer says the public can see in the organization's five-year report: a pie chart showing the percentage of the money that went to each sector. But he will not provide greater detail about where the money went. "We have provided, through our public website, where the money has gone by sector, and we stand by the accuracy of that information," he says. The charity's own documents, however, give some insight: Much of the money never reached people in need. First the Red Cross took a customary administrative cut, then the charities that received the money took their own fees. And then, according to the Red Cross' records, the charity took out an additional amount to pay for what it calls the "program costs incurred in managing" these third-party projects. To really understand what happened, take a look at one of the Red Cross' marquee projects — a housing project. The housing sector received more than double the funds that other sectors received, and it's the area in which the Red Cross made its biggest promises. Campeche and the surrounding neighborhoods are home to one of those projects. The town sits in a ravine in the hills of Port-au-Prince. People live inside shacks made of tarps and tin. There's no running water. Trash and human waste piles up at the bottom of the hill. In the steep, tight alleyways, residents smile warmly and greet passers-by with a Creole "bonswa." Above them all, at the top of the hill, the Red Cross has painted its name and logo across a large concrete wall. Jean Jean Flaubert, one of the neighborhood's leaders, was here when it was painted. He explains in Creole that about three years ago the Red Cross came with glossy booklets saying it was going to build hundreds of new homes, a water and sanitation system and a health clinic. "We still have tents," he says. "I am going to show you that the Red Cross has not intervened here at all. If you're talking about change, people should not be living like this still." The Red Cross promotes this project heavily in its annual reports and press releases, under the headline "Rebuilding Neighborhoods." It's costing $24 million. From the main roadway, Flaubert calls to the other leaders to join him in the one-room community center. Inside, the men pull plastic lawn chairs around a metal desk. Simon Julnet opens a filing cabinet and spreads out the booklets that the Red Cross gave them in 2012. Inside is a list of priorities they and the Red Cross agreed to for their area: homes, clinics, water and bathrooms. Asked about each one, the men shake their heads no. "First, three years ago," Julnet says, "the main plan was to build houses." The men say they think it's possible that the Red Cross will still build them homes. Flaubert says they have asked the Red Cross repeatedly to tell them what's going on. "We're fighting now with the Red Cross but we still do not have any answers," he says. When shown a Red Cross promotional brochure about the project, the men are stunned. The brochure says the project is scheduled to end next year. Far from new homes and new neighborhoods, it says the Red Cross will do smaller projects such as repairing some homes, walkways and schools. The Red Cross is also building a road. The brochure says the project is costing $24 million. "I don't understand an organization like the Red Cross acting like that," Julnet says. "If they have received that kind of money, maybe they paid their employees with it? That is OK. But that kind of money spent here in the community? No, that cannot be said." The men break into a heated conversation in Creole. They pause for a moment and ask us if they can meet with the Red Cross. Later that night, the Red Cross' head of public affairs in Washington, D.C., sent NPR and ProPublica an email saying we had mischaracterized the project, though they did not dispute the information in the brochure. NPR and ProPublica were "creating ill will in the community, which may give rise to a security incident," the email says. "We will hold you and your news organizations fully responsible." No security incident happened — but residents did ask if they could keep the brochure. The Red Cross' internal emails and memos from the Campeche project show that the residents were right: The original plan was to build 700 new homes with living rooms and bathrooms. The Red Cross says it ran into problems acquiring land rights. Their internal memos, however, show there were other serious problems, including multiple staffing changes and long bureaucratic delays. And then there was a period of almost a year when the whole project appears to have sat dormant. While all this was happening, a thousand miles away in Washington at Red Cross headquarters, things weren't going much better. The Red Cross' own memos and emails offer clues into what was happening. There were multiple warnings about internal delays clogging up efforts to get projects off the ground. Frustrated managers in Haiti wrote notes to supervisors waiting for approvals from headquarters. Lee Malany, who ran the Red Cross' shelter program in Haiti starting in 2010, says problems started right after the earthquake. "They never had a real plan for what they wanted to do in housing," Malany says. Malany remembers flying in the fall of 2010 from Haiti to Red Cross headquarters, where he and other colleagues gathered in a conference room with the charity's top leadership. He says the senior managers didn't seem to have any idea how to spend tens of millions of dollars set aside for housing. "When I walked out of that meeting, I looked at the people that I was working with and said, you know, 'this is very disconcerting, this is depressing,' " Malany recalls. He says that there was "no talking about what is our overall program, and if we do this where's it going to go, and is this the best place to go." He says the leadership, including Red Cross CEO Gail McGovern, seemed more concerned with which projects would generate good publicity. "She was the one who made the statement 'well, I think that would be OK and that will look all right,' " he says. "And the way I read it — to translate it — is: 'This will look OK on the checklist, and we can give it to the public and not get any pushback.' "
Red Cross officials dispute Malany's recollections of the meeting, saying that a housing strategy was discussed at the meeting and that the organization never would have put public relations over Haiti's needs. Three years later, though, documents show that officials in Washington were still struggling with how to spend housing money. McGovern wrote an email to her senior staff in November 2013 saying that a particular housing project was "going bust." Red Cross officials wouldn't say what she meant by the helicopter idea, but it's a common reference in economics to giving money away — as in, throwing it out of a helicopter. Either way, that's not what she promised donors and the public in 2011. Back then, McGovern went to a luncheon at the National Press Club in Washington and said that a fifth of the money the charity raised would go to "provide tens of thousands of people with permanent homes ... where we develop brand-new communities ... including water and sanitation." The charity built six permanent homes and, according to their own account, no new communities. Many of the projects it started ran into trouble. There was a $13 million development effort in the northern part of the country. An internal review of the project found that local residents were angry because it had been more than two years and they hadn't seen anything useful happening. The review observed that neighbors had begun to "reject the project" entirely. The review also found that officials spent some of the money teaching residents to wash their hands with soap and water — and that the residents did not have access to either soap or water. Another project, started in a place called Quartier-Morin, was wracked by delays and high turnover, according to a government review. First it spent two years on hold, and then it was canceled. Then the Red Cross worked with the U.S government to come up with a replacement project – which took another year. Now the U.S. government is holding the money and is currently trying to find a different charity to run this 4-year-old housing project, which has yet to produce a single home. Meltzer, the Red Cross lawyer, says that land ownership and government issues often were outside of the charity's control. "For the American Red Cross and the Red Cross in general, shelter has been a priority," says Meltzer, adding that the Red Cross has "provided homes for more than 130,000 Haitians. "If you go to [those] people and ask them where they are living today, they will tell you 'I am living in my home,' " he says. But if you go in search of those tens of thousands of new permanent homes in Haiti, you won't find them. 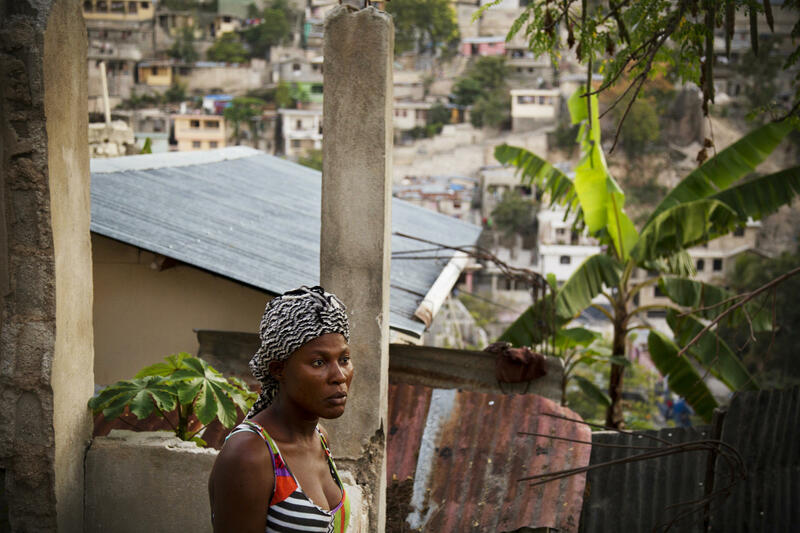 After several emails, the Red Cross acknowledged that the "130,000 Haitians" figure is made up of people who went to a seminar on how to fix their own homes, people who received temporary rental assistance, and thousands of people who received temporary shelters — which start to disintegrate after three to five years. Archaic land title and government requirements make building in Haiti very difficult and time-consuming, but other charities have built almost 9,000 homes so far, according to figures from Global Shelter Cluster. For example, Global Communities and PCI are building multifamily homes with running water after completing more than 300 homes in the neighborhood of Ravine Pintade. John Wildy Marcelin, a Haitian engineer, is head of construction for the project, and says the new homes will have kitchens and bathrooms. He says the project has been successful because the majority of the staff and managers are also Haitian — and are passionate about rebuilding their country. "All this work that you are looking at now, the calculation was made by Haitian people, Haitian engineers, Haitian architects, Haitian foreman," he says. "We know what to do." The Red Cross does not seem to have used that strategy. In one internal memo, the top manager of the Haiti program complains that Haitians were not being hired for top positions — and in some cases were treated disparagingly. In a 2011 memo, the then-director of the Haiti program, Judith St. Fort, wrote that senior managers had made "very disturbing" remarks disparaging Haitian employees. St. Fort, who is Haitian-American, wrote that the comments included "he is the only hard working one among them" and "the ones that we have hired are not strong, so we probably should not pay close attention to Haitian CVs." Several current and former employees told NPR and ProPublica that many managers could not speak French or Creole. "Going to meetings with the community when you don't speak the language is not productive," says Carline Noailles, one of the former staffers. Sometimes, she recalls, Red Cross staffers would skip such meetings entirely. The Red Cross says it has "made it a priority to hire Haitians" and enlisted the help of a human resources firm. It says more than 90 percent of its staff is Haitian. Yet interviews with former staffers and a review of the charity's staff lists show very few of those Haitians made it to top positions. That has proved costly for the charity. According to an internal Red Cross budgeting document for the project in Campeche, the project manager — a position reserved for an expatriate – was entitled to allowances for housing, food and other expenses, home leave trips, R&R four times a year, and relocation expenses. In all, including salary, it added up to $140,000. But those weren't the only problems hindering efforts. Memo after memo sent to Washington by managers in Haiti warned of problems like gaps in staffing, high turnover, and severe internal delays — many caused by the Washington office. The problems most notably affected the charity's efforts to fight cholera. That was in the critical early weeks while thousands of people died. Paul Christian Namphy, a Haitian water and sanitation official who helped lead the effort to fight cholera, says early failures by the Red Cross and other NGOs had a devastating impact. "These numbers should have been zero," he says. St. Fort summed up her 2011 memo: "To maintain the status quo, will only yield the same failed results." Meltzer, the Red Cross lawyer, says the charity did not fail. "When I look at where Haiti is today, I feel very good about the progress we have made as the American Red Cross and the entire humanitarian sector," he says. These days the American Red Cross is preparing to leave Haiti — it's handing over operations to the Haitian Red Cross next year. It's also getting ready to leave the hills of Campeche and its surrounding neighborhoods, where it will have spent $24 million and once promised residents it would build new homes. The residents here will get a new road, and some homes and schools will be repaired. But like much of the American Red Cross' work in this country in the five years after the earthquake, that was not what residents expected. Journalist Mitzy-Lynn Hyacinthe contributed reporting to this story. Do you have a tip to share? Email NPR correspondent Laura Sullivan. NPR's Laura Sullivan has spent the last several months reporting on the American Red Cross. Last fall, along with ProPublica, she brought us an investigation into their response to Superstorm Sandy, and she's here with us again. Hey there, Laura. CORNISH: So you've turned your attention now to the American Red Cross and their response to the earthquake in Haiti. SULLIVAN: That's right. It was one of their biggest fundraising efforts ever. Millions of people donated. You might remember the Super Bowl fundraiser that the American Red Cross did. Michelle Obama came out and called on Americans to donate. It was a huge outpouring of support. CORNISH: And what was the result? How much money did they raise? SULLIVAN: We're talking about almost half-a-billion dollars. After the initial emergency relief aid, the American Red Cross said it was going to spend that money rebuilding neighborhoods and rebuilding lives. CORNISH: But did they? What did you find? SULLIVAN: Well, we looked through hundreds of internal emails and memos and interviewed current and former employees of the Red Cross. And what is clear is that what the Red Cross was saying it accomplished in Haiti is very different from what it actually has, so ProPublica's Justin Elliott and I went to Haiti to try to figure out where some of that money went. SULLIVAN: Here in the sprawling city of Port-au-Prince, most people don't have drinkable water or toilets. Many live in squalor. Half of all kids don't go to school. That was true before the earthquake and it's still true now. The government's annual budget without foreign aid was about a billion dollars. So if you had half that amount that you could give to this country, what would you do with it? The American Red Cross said it was going to rebuild lives and rebuild neighborhoods. But ask a lot of Haitians where they think that money went, and they will tell you they don't have any idea, even the country's former prime minister. JEAN-MAX BELLERIVE: Five-hundred million in Haiti is a lot of money. It's a lot of money. SULLIVAN: Jean-Max Bellerive was Prime Minister until 2011. He knows the country's budget and what that kind of money can do. BELLERIVE: I'm not a big mathematician, but I can make some additions. It doesn't add up for me. SULLIVAN: I went to meet Bellerive one day recently with ProPublica's Justin Elliott. We found him in his living room high above Port-au-Prince talking with Joel Boutroue. Boutroue was the U.N. deputy special representative in Haiti, and he says he doesn't know where the 500 million went either. As they sip coffee, they consider the Red Cross's claim. All the money went to help 4.5 million Haitians get, quote, "back on their feet." BELLERIVE: No, no, it's not possible. We don't have that population in the area affected by the earthquake. JOEL BOUTROUE: You know, 4.5 million people is almost all - it was 100 percent of the urban area in 2010 - 100 percent. That would mean that the American Red Cross would have had to serve the entire cities of Haiti. SULLIVAN: It wouldn't be unheard of for the Red Cross to make such a claim. Not long ago, the charity hired a group of consultants to review one of its projects in the north. They found the charities math unreliable when it came to counting people it helped. There was double-counting, undercounting, and in one instance, the Red Cross claimed to have helped more people than actually live there. So how did the Red Cross spend half-a-billion dollars in Haiti, and what exactly does it have to show for it? We obtained hundreds of pages of internal documents and interviewed more than a dozen current and former Red Cross officials. We found a string of poorly-managed projects and questionable spending. The Red Cross has always been known for its media disaster relief work, providing things like food and blankets. It did that work in Haiti as well. But the Red Cross has very little experience in the work of rebuilding in a developing country, and yet, the charity outraised other nonprofits by hundreds of millions of dollars to do just that. Now, five years later, the total number of new homes the Red Cross has built in Haiti is six. We took our reporting and documents to the Red Cross and sat down with David Meltzer. He's the Red Cross's top lawyer and runs the international division. Meltzer told us that the charity helped millions through trying and difficult circumstances. DAVID MELTZER: The Red Cross has provided clean water, sanitation, vaccinations, disaster preparedness, cholera prevention. All of the money that has been spent has been focused on benefiting the people of Haiti. SULLIVAN: But that's where things get tricky. The Red Cross says it took the almost 500 million and split it into sectors - 69 million on emergency relief, 170 million providing shelter, 49 million on water and sanitation and so on. The Red Cross will not say what kind of programs they ran, how much they cost or what their expenses were. Neither would David Meltzer. MELTZER: Well, you can certainly see in our five-year report what percentage of the dollars have been spent on shelter, on water, on sanitation. SULLIVAN: Why can't you tell us where you spent the money and what your expenses were? You obviously have that information. Why can't the public see that? MELTZER: We have provided, through our public website, information about where the money has gone by sector. And we stand by the accuracy of that information. SULLIVAN: Without question, the Red Cross spent millions of dollars on food, tents and water tablets. It gave money to new hospitals, vaccination programs, portable toilets, a water treatment plant. But spend some time reading through the Red Cross's internal documents, and you'll also see that much of the money the charity raised never reached people in need. That's because the Red Cross outsourced most of the hands-on work to other charities, which breaks down like this. First the Red Cross takes out a customary administrative fee. Then the charities they give money to take out their own fees. But even after those fees, the documents show the Red Cross takes out an additional cut to pay for what it calls the management cost of running these third-party projects. In one case, we found all of these costs ate up a third of the money that was supposed to go to helping Haitians. But if you really want to understand what happened to the money in Haiti, take a look at one of their marquee projects - a housing project because housing is where most of the money went. And it's where the charity made its biggest promises, like their project in and around the neighborhood of Campeche. SULLIVAN: We went there one afternoon recently. 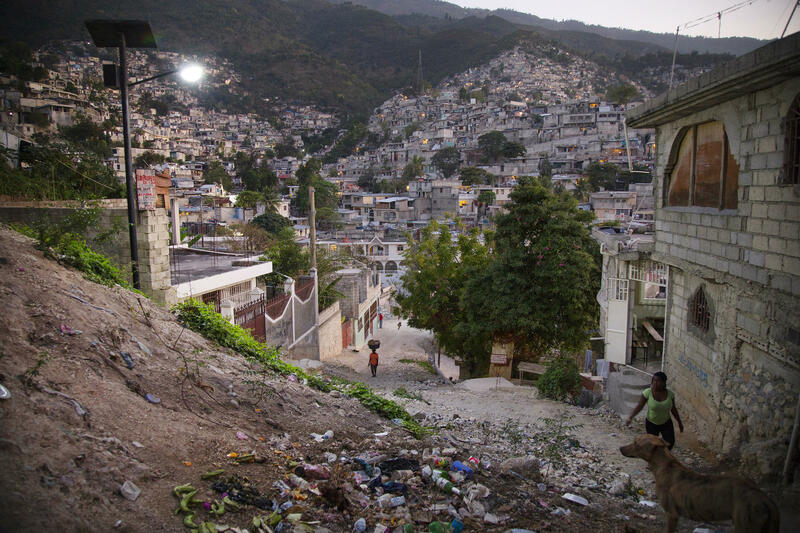 Campeche sits on a ravine in the hills of Port-au-Prince. It was poor before the earthquake, and it's still poor now. Many people live inside shacks made of tarps and tin. There's no running water. Trash and human waste piles up at the bottom of the hill. UNIDENTIFIED WOMAN #1: Bonsoir. Bonsoir. SULLIVAN: As you walk past people's homes on the steep alleyways, everyone - one shack to the next - smiles and greets you. Above them, at the top of the hill, the Red Cross has painted its name and logo across a large concrete wall. JEAN JEAN FLAUBERT: (Speaking Creole). SULLIVAN: Jean Jean Flaubert was here when they painted it. He's one of the neighborhood's leaders. As he walks through the alleyways, he tells us that about three years ago, the Red Cross came with glossy booklets. He explains in Creole to our translator that officials said they were going to build hundreds of new homes, a water and sanitation system, a health clinic. FLAUBERT: (Through interpreter) We still have tents here. I'm going to show you that Red Cross has never intervened here at all. People shouldn't have - not have been living like this still. SULLIVAN: The Red Cross promotes this project heavily. It's in its annual reports and press releases under the headline Rebuilding Neighborhoods. It's costing $24 million. SULLIVAN: From the main roadway, Flaubert calls to the other leaders to join him in the one-room community center. Inside, the men pull plastic lawn chairs around a metal desk. A man named Simon Julnet opens a filing cabinet and spreads the booklets the Red Cross gave them in 2012. Inside is the list of priorities they and the Red Cross came up with for their area - homes, clinics, water, bathrooms. Asked about each one, the men shake their heads no. SULLIVAN: The men tell us they think it's possible that the Red Cross is still going to build them homes, but maybe they just haven't gotten to their neighborhood yet. Flaubert says they have asked the Red Cross repeatedly to tell them what is going on. FLAUBERT: (Through interpreter) OK. He said we are fighting now with the American Red Cross, and still, we don't have any answers. SULLIVAN: We didn't have any answers either, but we did have a Red Cross promotional brochure. So we showed it to them. Far from building new homes and new neighborhoods, it says the Red Cross is doing smaller projects, like repairing some walkways and homes and schools. It is also paving a road. The brochure says these projects in Campeche and the surrounding area are costing $24 million. The men look at each other, stunned. Julnet is the first to speak. SIMON JULNET: (Through interpreter) I don't understand an organization like the Red Cross acting like that. If they have received that kind of money, maybe they pay their employees with it. That's okay. But that kind of money spent here in our community? No, that cannot be said. SULLIVAN: The men break into a heated conversation in Creole. They pause and look at us and our translator. UNIDENTIFIED WOMAN #2: OK. What he was saying - he was asking if there is a way that we can bring the Red Cross here to a meeting with them. I was explaining to them that we are not able to make them come. SULLIVAN: He was asking if we could bring the Red Cross to them. Later that night, after we left Campeche, the head of public affairs for the Red Cross in Washington sent us an email saying we had mischaracterized the project to residents. The public affairs official said we were, quote, "creating ill will in the community, which may give rise to a security incident." "We will hold you and your news organizations fully responsible," the Red Cross said. No security incident ended up happening, but residents did ask if they could keep the brochure. When we went back through the Red Cross's internal emails and memos from the project, we found the original plan was to build 700 new homes with living rooms and bathrooms. The charity says it ran into problems with land rights. But its records show there were also multiple staffing changes, long internal delays over hiring and a bureaucratic approvals. And then there was a period when the whole project appears to have sat dormant for almost a year. 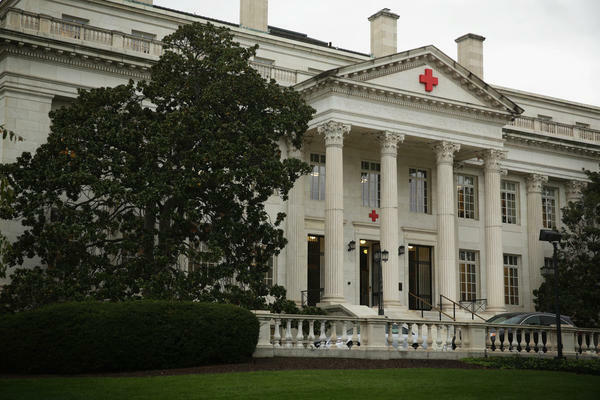 While all this was happening, a thousand miles away in Washington, D.C., at Red Cross headquarters, things weren't going much better. CORNISH: That's NPR's Laura Sullivan. When we return, she'll continue her investigation into what happened to the nearly half a billion dollars Americans donated to the American Red Cross following the 2010 earthquake in Haiti. Stay with us. 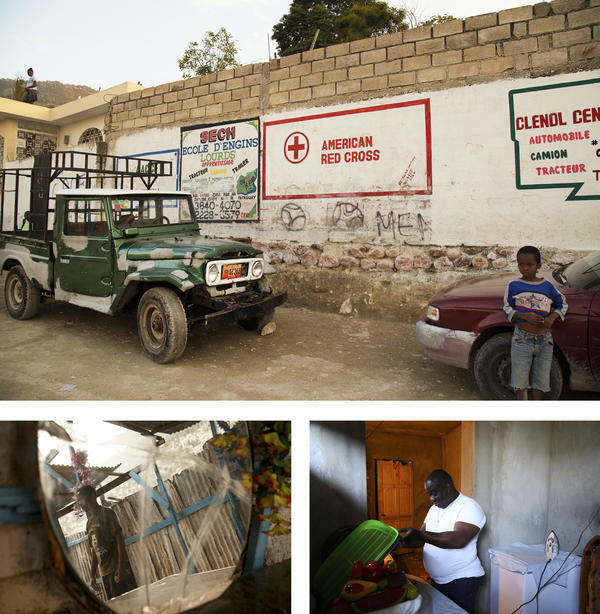 We return now to our examination with ProPublica of the American Red Cross's response to the 2010 earthquake in Haiti. As we've heard, the charity promised to help the country rebuild and had nearly half a billion dollars to work with. 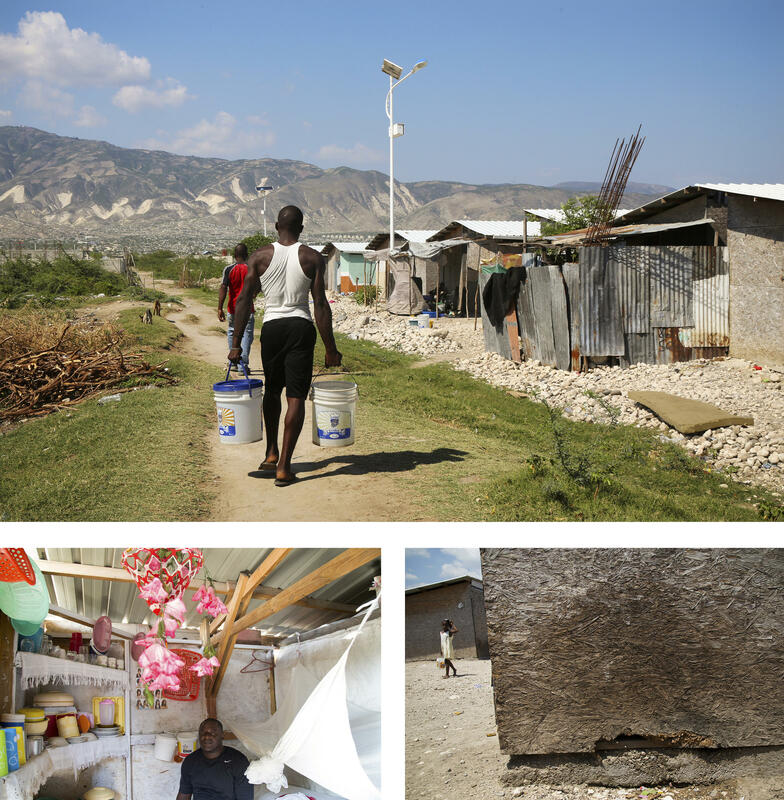 After the initial emergency relief, the charity turned much of its focus to housing, and frustration grew in Haiti over project delays. NPR's Laura Sullivan picks up our story in Washington where things weren't going much better. SULLIVAN: The Red Cross's memos and emails are a clue into what was happening at the organization's headquarters. There were multiple warnings about internal delays clogging up efforts to get projects off the ground. 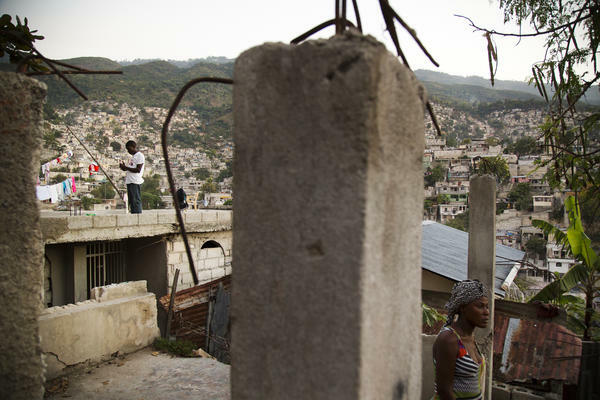 Frustrated managers in Haiti wrote notes as they waited for approvals from headquarters. Lee Malany was one of them. He ran the Red Cross's housing and shelter program starting in 2010, and he says problems started right after the earthquake. LEE MALANY: They never had a real plan for what they wanted to do in housing. SULLIVAN: Malany remembers flying from Haiti to Red Cross headquarters in D.C. with several colleagues in October of 2010. They gathered in a conference room with the charity's top leadership. He says the senior managers didn't seem to have any idea how to spend tens of millions of dollars set aside for housing. MALANY: When I walked out of that meeting, I looked at the people that I was working with and said, you know, this is very disconcerting. This is depressing - no talking about what is our overall program and if we do this, where's it going to go and is this the best place to go. SULLIVAN: He says the leadership, including Red Cross CEO Gail McGovern, seemed more concerned with which projects would generate good publicity. MALANY: She was the one that made the statement - well, I think that would be OK; that would look all right. And the way I read it - to translate it is, is that this would look OK on the checklist. And we would give it to the public, and we wouldn't get any push back. SULLIVAN: Red Cross officials dispute Malany's description of the meeting and say they did discuss housing strategy and would never put public relations over Haitians' needs. Three years after that meeting, though, documents show officials in Washington were still struggling with how to spend housing money. McGovern wrote an email to her senior staff in November of 2013 saying a particular housing project was, quote, "going bust." We're still holding 20 million, she writes; any ideas on how to spend the rest of this besides the wonderful helicopter idea? That's a common reference in economics to giving money away, as in throwing it out of a helicopter. But officials wouldn't say if that's what she meant. Either way, it's not what she promised donors and the public in 2011. Back then, McGovern went before a luncheon at the National Press Club in downtown D.C. She said a fifth of the money the charity raised would go to provide Haitians with permanent housing. GAIL MCGOVERN: To provide tens of thousands of people with permanent homes where we develop brand new communities, including water and sanitation. SULLIVAN: After five years and millions of dollars, the total number of new permanent homes the Red Cross has built in Haiti is six. According to their own account, the total number of brand new communities is zero. Many of the projects they did start seem to go nowhere. Take a 13-million-dollar development effort in the northern part of the country. We read the Red Cross's own recent review of the project, and it found local residents are angry because it's been more than two years, and they don't see anything useful happening. Very little, if anything, has been built. The review found that officials spent some of the money on a campaign to teach residents to wash their hands with soap and water. The reviewers then note that these residents do not have access to soap or water. Then there was another project in a place called Quartier-Morin. It's been wracked by delays and high turnover. First, the project spent two years on hold, then got canceled. The Red Cross spent another year trying to come up with a new project that the U.S. government would oversee. Now the U.S. government has the money and is currently looking for another charity to run this four-year-old housing project that has yet to produce a single home. MELTZER: For the American Red Cross and the Red Cross in general, shelter has been a priority. SULLIVAN: David Meltzer, the lawyer from the Red Cross, says land ownership and government issues were often outside of the charity's control. He says the Red Cross has provided homes for more than 130,000 Haitians. MELTZER: I think if you go to the people and ask them where they are living today, they will tell you, I'm living in my home. SULLIVAN: But if you go in search of tens of thousands of new homes in Haiti, you won't find them. The Red Cross acknowledged this in an email. The vast majority of that number is made up of people who went to a seminar on how to fix their own homes, people who received temporary rental assistance and thousands of people who received temporary shelters, which start to disintegrate after three to five years. 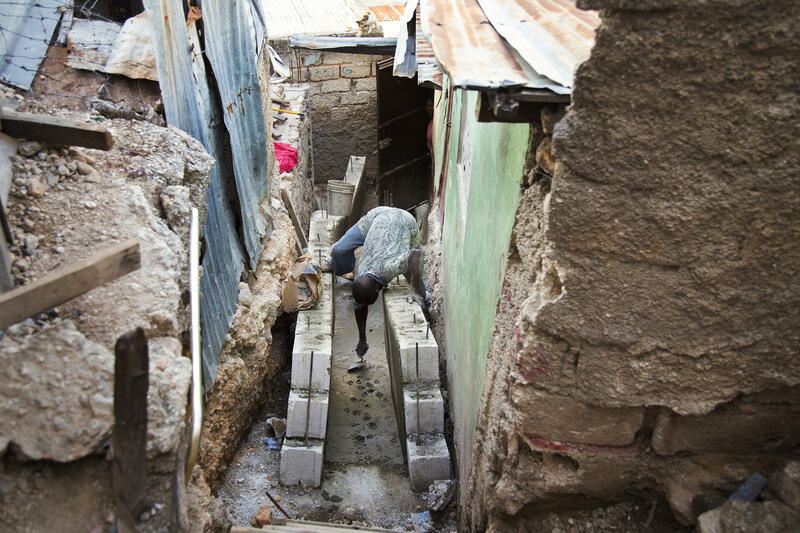 To be sure, building in Haiti is very difficult. Land title and government requirements are complex and time-consuming. But still, it can be done. A nationwide review found other charities have built almost 9,000 homes so far. Not far from the Red Cross's neighborhood development project in Campeche, two charities, Global Communities and PCI, built 260 one-story homes and 75 two-story homes and rebuilt the main road in Ravine Pintade. Now the charities are building a series of multifamily homes with running water. JOHN WILDY MARCELIN: (Through interpreter) This little house will have two bedrooms. And this is the kitchenette living room, and this will be the bathroom. SULLIVAN: John Wildy Marcelin is head of construction. He says this project's had a lot of momentum because the majority of the managers are Haitian. He says they're passionate about rebuilding their country. MARCELIN: (Through interpreter) All this work you are looking at now, the calculation was made by Haitian people, Haitian engineers, Haitian architects, Haitian foreman. We know what to do. SULLIVAN: The Red Cross does not seem to have used that strategy. One manager emailed supervisors in Washington complaining that Haitians were not being hired for top positions and in some cases, were treated disparagingly. Current and former employees told us the Red Cross relied on foreigners who often couldn't speak either French or Creole. Monthly memos warned of gaps in staffing, high turnover and long HR delays, especially with the charity's efforts to fight cholera. That was in the critical early weeks while thousands of people died. The head of the Haiti Program summed up her thoughts in an email in 2011. To maintain the status quo, she wrote, will only yield the same failed results. David Meltzer says the charity did not fail. MELTZER: When I look at where Haiti is today, I feel very good about the progress that we have made as the American Red Cross and the entire humanitarian sector. SULLIVAN: These days, the American Red Cross is preparing to leave Haiti. It's handing over operations to the Haitian Red Cross next year. It's also getting ready to leave the hills of Campeche. Up this hill - OK. When we dropped in again before we left, residents were still holding on to the Red Cross promotional brochure we gave them. In its pages, they can see that their hope for a brand-new neighborhood of new homes and new lives will not come to be, that this neighborhood project is not finally winding up as they thought but is, in fact, winding down. And they do not understand how it will have cost $24 million. Jean Jean Flaubert stops in front of the wall with the Red Cross logo. He, like many Haitians, now five years after the earthquake, says he doesn't know where all the money could have gone. SULLIVAN: He says the Red Cross told them they would change their neighborhood completely. Now, he says, I do not understand what kind of change they're talking about. Laura Sullivan, NPR News. BLOCK: And you can see some of the Red Cross's internal documents and emails from the story on our website and on propublica.org. Transcript provided by NPR, Copyright NPR.